The U.S. Bank Cash 365 American Express Card currently has an Informr score of 7.4 out of 10. This score is based on our evaluation of 7 sources including reviews from users and the web's most trusted critics. U.S. Bank Cash 365 American Express Card is typically available to those with good credit scores (650 or greater). The U.S. Bank Cash 365 American Express Card isn’t anyone’s idea of groundbreaking. With a flat cash back rate, an easy-to-understand rewards program, and a nice introductory balance transfer promotion, it’s not all that different from other straightforward cash back competitors. You may earn more rewards with another card. But if you want simple cash back, the U.S. Bank Cash 365 American Express Card can be a refreshing option — especially as it offers $0 annual fee, a signup bonus and 0% intro APR on balance transfers. 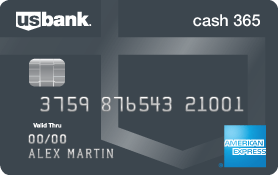 The U.S. Bank Cash 365™ American Express® Card is an excellent choice if you’re looking for a cash back credit card specifically from U.S. Bank. The fixed 1.5% rewards rate is great for individuals with varied spending who want a simple rewards credit card. If you’re still using a debit card for all of your purchases, consider getting a credit card instead and get rewarded for spending money. That way the more you spend, the more you earn, especially with this card because you get an unlimited amount of bonus points back. This card offers a $150 intro bonus opportunity to cardholders who spend $500 on purchases in the first 90 days of account opening — that’s a 30% bonus! On top of that, this card offers great ongoing cash back rewards, a long 0% intro APR on balance transfers and more. We think this is a good middle-of-the-road card that will give you a decent chunk of free cash the first year and then average returns after that. The best way to take advantage of this card and other cash back cards is to pay off your balance in full, every month. If you don’t, the interest payments you make undercut the cash back you earn. I don’t see why anybody would sign up for this new card since there are cards that offer 2% cash back or more on all purchases and plenty of cards with a sign up bonus of more than $100. The one upside to this card is that it’s an American Express card, so you can enroll in AmEx Sync Twitter offers, but good ones have been pretty thin recently.